Leading side tipper manufacturer, AZMEB Bulk Transfer Systems will be exhibiting at May’s Brisbane Truck Show for the first time. AZMEB plans to introduce its products to a wider audience at the truck exhibition including its top selling door side tippers, further boosting the brand’s recognition in the market following its recent expansion. According to AZMEB General Manager, Simon Martin, while the brand is widely used around Australia, he is looking forward to making even more operators aware of the advantages of AZMEB trailers. Since AZMEB’s acquisition by MaxiTRANS in mid-2012, the brand has been made much more accessible by building a dealer network around the country covering most capital cities, as well as a national service and parts network, which gives owners a greater degree of backup should they need it. Speaking ahead of the Brisbane Truck Show, Mr Martin highlighted the main benefits of the brand’s door side tippers, which have been designed on the strength of over 25 years of experience in side tipper manufacture. 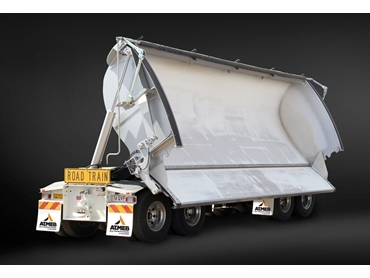 AZMEB Bulk Transfer Systems can be found on Stand 41 at the Brisbane Truck Show. The show runs from 16th to 19th May 2013 at the Brisbane Convention and Exhibition Centre. Freighter trailers are available from MaxiTRANS.